Gridiron fans don't have to wait until September to back their favorite NFL teams. 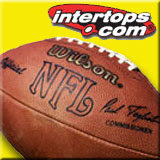 Intertops.com – the company that took the first online wager ever – is the first online sportsbook to post betting offers for the 2007 NFL Regular Season. Week One lines and dozens of props, including Divisional Winners and who will win Super Bowl XLII, are already online at http://www.intertops.com/. The New England Patriots are the early favorites to win Super Bowl XLII in Arizona next February. Intertops.com odds favor the Pats to face the Chicago Bears (+1800), New Orleans Saints (+2200), Dallas Cowboys (+2500) or Philadelphia Eagles (+2500). The Patriots, who open their training camp at Gillette Stadium July 27th, have signed several strong players recently, including athletic Baltimore linebacker Adalius Thomas. Some question the decision to trade for former Raider bad boy Randy Moss but Pats fans have Bill Belichick to keep him in line. Tom Brady must be pleased the team has also signed free agents Donte' Stallworth (Philadelphia) and Kelley Washington (Cincinnati). In addition to Super Bowl XLII props, Intertops.com Sportsbook has also posted odds for September NFL games, including the season opener between Indianapolis and the Patriots. The long-established gambling site offers a wide variety of NFL props including Spread Winner, Over/Under Totals and Straight Up bet on the outcome of the game. The popular casino, poker and sportsbetting site also takes First Half and Second Half Side, Spread Winner and Totals wagers. Intertop's current NFL lines.